Should I use any additives to clean the inside of my pipes? I have a Burnham IN5 steam boiler. For your pipes I've heard prunes work really well. Seriously though, no, steam pipes stay pretty steam cleaned on their own. Returns can be flushed if need be. For the boiler I'd build a wand and wash the boiler out followed by 1 or 2 Rectorseal Steamaster tablets. 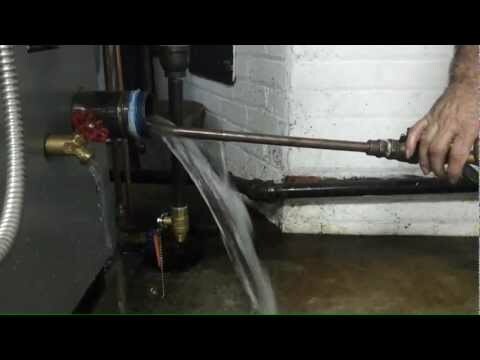 Here's a video of washing a boiler out using a wand by Gerry Gill. I use my wand via the skimmer port on the boiler and catch the dirty water in a bucket as I have a partial dirt floor and no drain. I drained more then a few gallons from the drain valve, all very dirty, which give me the idea of cleaning. I also cleaned all the connections on the side (pressure gauge, sight glass, cut-off) and they were very dirty, especially the pigtail. Right now the the water in the sight glass is almost clear and bounces around 1/2". The returns were drained recently. After using a couple of Steamasters, should I drain some (all?) water again or not? If you want to wash the boiler with it, throw in 3 or 4 tablets and try to get the boiler to run for a while. This will clean the boiler to an extent. Drain the boiler, refill, drain again and refill. Put 1 tablet in and fire the boiler and produce steam for 10 - 20 minutes. Leave the 1 tablet in was treatment to reduce corrosion.